In the occasion of the holiday season and the arrival of the New Year, on behalf of the Khmers Kampuchea-Krom Federation (KKF), I would like to wish you and your family a joyful, bright, healthy, prosperous and happiest new year ahead. Happy New Year! In 2015, the KKF members and leaders have travelled around the world: New York City, Washington DC, San Francisco, Montreal, Paris, Brussels, Geneva, The Hague, Kuala Lumpur, etc, to let the world know what the issues that the voiceless Khmer-Krom people in Vietnam are facing. The achievement that KKF received has helped to build a strong foundation for the KKF to move to the next level in the journey to seek the fundamental rights for the indigenous Khmer-Krom peoples. In March, KKF sent a delegation to attend the 28th regular session of the UN Human Rights council in Geneva when the Special Rapporteur on Cultural Rights, Farida Shaheed, and Special Rapporteur on freedom of Religion or Beliefs, Heiner Bielefeldt, presented reports on their missions to Vietnam. Mr. Bielefeldt opened up a side event for Religious Freedom in Vietnam and The Mekong Delta, co-organized by the KKF. From February to May, KKF delegations made many trips to Washington DC to meet the US Houses of Representatives, the representatives of the US Department of State, regarding religious freedom in Vietnam. KKF representatives also attended the ASEAN Civil Society Conference/ASEAN People’s Forum 2015 Wisma MCA, Jalan Ampang, Kuala Lumpur in April. In May, KKF representatives attended the Committee on Non-Governmental Organizations of ECOSOC reviewing the KKF application. The Committee spent more than thirty minutes just to review KKF application which led to a frank discussion. The Committee could not come to a decision and sent three questions to KKF for clarification. KKF responded to the questions in September. To clarify the mission of KKF, we responded “Building, not breaking up, the self and the state is the core belief of the KKF”. The Committee will resume starting on January 25, 2016. June is always a busy month for KKF. The Khmer-Krom around the world organized the June 4th event to commemorate the tragic day that the Khmer-Krom lost their fundamental rights living on their ancestral land. In the same month, KKF delegation went to meet the representatives of the European Parliament in Brussels and UNHCR in Geneva. The meeting with UNHCR representatives helped answer all the concerns regarding the problems of the Khmer-Krom refugees seeking for asylum status in Bangkok. After June, many Khmer-Krom refugees in Bangkok received asylum status and migrated to live in North America and Europe. KKF delegation also attended the commemoration of the 70th anniversary of the signing of the UN Charter at the City Hall of San Francisco. The UN Secretary-General was also present to deliver a remarkable speech at this special event. In July, KKF delegation attended the 61st Session of the UN CEDAW reviewing Vietnam in Geneva. Prior to attending this meeting, KKF submitted the alternative report in May to inform the CEDAW experts on the main issues facing Khmer-Krom women in Mekong Delta for its pre-session meeting. It was promising to see that the Vietnamese government allowed the NGOs from Vietnam, even those NGOs were established by the government, to attend as well. 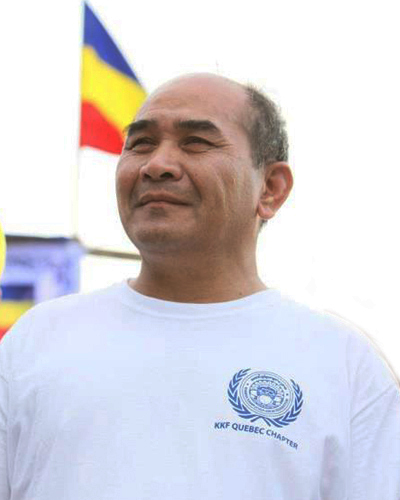 In August, KKF organized the Khmer-Krom Day in Montreal, Canada. It had been the biggest event. The city of Montreal started recognizing this event and provided support. In September, a KKF representative attended the UN Sustainable Development Goals meeting in New York City. On November 20, KKF has been accepted as an official member of the UN Department of Public Information (UN DPI). In order to be a member of UN DPI, KKF had to prove that it is a legitimate organization that truly works to protect and promote human rights for the voiceless Khmer-Krom in Kampuchea-Krom. As a member of UN DPI, the KKF will be given 6 passes (1 for head of the organization, 3 for adult members, and 2 for youths) to participate in any UN meetings in both New York City and Geneva. From 7-8 December, KKF delegation attended the 6th annual sustainable innovation forum 2015 (COP21) in Paris. From December 18-20, more than 100 KKF members travelled from around the world to attend the KKF year-end meeting in Tacoma, Washington state, to update the KKF members about their activities in their chapters and provide recommendations for the KKF’s resolution for 2016. Today Khmer-Krom students can learn the Khmer language, but limited to a couple of hours a week. However, we still see that not all area where Khmer-Krom resides have such opportunity. The Vietnamese government allows Khmer-Krom students to take days off during the Khmer New Year in some schools, but not all schools where Khmer-Krom students study. The Khmer-Krom Buddhist followers now have some more freedom in organizing the religious ceremonies in their houses and temples, but they need to ask for permissions to organize such events and still be heavily monitored. Today Khmer-Krom can wear traditional clothes to attend cultural and religious event, such as Kathina, without harassment from the local authority. Khmer-Krom families who are classified as poor family in certain areas have access to healthcare insurances, but not all. Khmer-Krom now can watch more Khmer programs on the Vietnamese television station. Unfortunately, the contents are restricted to propaganda of the government’s policies instead of allowing Khmer-Krom to freely and creatively create their own programs. The Khmer-Krom people from abroad visiting their homeland are less harassed by the local authority. However, they are still required to report to local police about their stay even though the Vietnamese Government do not require them to do so. It is still heavily regulated in dense Khmer-Krom communities. Unfortunately, there were some cases that the Khmer-Krom visitors are still being summoned to question about the activities of KKF even those activities are publicly posted on the Internet. As an organization advocating for the fundamental rights of the Khmer-Krom, KKF has urged Vietnam to have an open dialog at the UNPFII for many years to address the issues that the Khmer-Krom people are facing instead of continuing to accuse and attempt to discredit KKF’s genuine advocacy. Today, KKF is an official member of DPI. It shows that the works KKF has been advocating for have positively contributed to the mission of the various United Nations institutions focusing on fundamental freedoms. The KKF’s 2016 plan of action has laid out the framework for KKF to move to the next level. 2016 is also the year that Vietnam will have new leaders elected into office by January. Hopefully, Vietnam’s newly elected leaders will have an open-mind to accept the recommendations from the civil society organizations in and outside of Vietnam so people in Vietnam could enjoy the fundamental freedoms, especially the religious freedom. Venerable Lieu Ny and Venerable Thach Thuol are still being imprisoned. They should be released in this coming year. Moreover, engaging in open dialog with civil society organizations should help Vietnam to successfully combat corruption that cause many provinces in Mekong Delta, such as Ca Mau and Bac Lieu, where majority of Khmer-Krom reside, to face budget crisis. The Khmer-Krom employees who work for local government in these provinces have concerned that they might not be able to receive their salaries in 2016. As the New Year dawns, we will keep our Khmer-Krom spirits and determination unshaken. May the New Year bring our beloved Khmer-Krom FREEDOM-JUSTICE-DEMOCRACY!